May is National Asthma Awareness Month. Asthma is a chronic lung disease in which the airways become inflamed and narrowed. Breathing becomes extremely difficult, and there will be periods of shortness of breath, wheezing, chest tightness, and coughing. An asthma attack occurs when the symptoms become severe. Asthma attacks are dangerous and require immediate emergency care. They can be fatal. Over 6 million children have asthma. There is no cure for asthma, but the disease can be managed with proper treatment and medication. Most people with the disease can live normal, active lives. 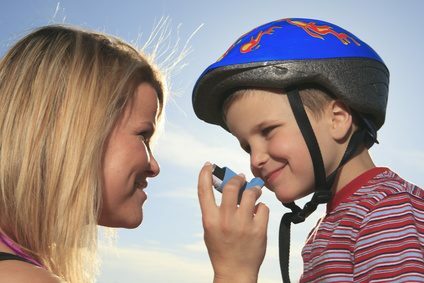 If your child has asthma, you will want to learn everything you can about the disease. Share that information with family and friends. Even if your child doesn’t have asthma, it would be wise to learn about the symptoms in case one of their friends has an attack while visiting your home. When a child of separated or divorced parents has a chronic illness such as asthma, the care issues become more complicated. When looking at custody, the ability to care for the child becomes important. If you have shared custody, or if your former spouse will be spending time alone with your child, then you both will have to work together to make sure your child is properly cared for. Depending on the illness, this can be difficult even when you both get along, almost impossible when you don’t. Let’s look at some of the considerations. You both need to be using the same doctor for your child. Trying to use two different doctors can cause conflicts with treatment and medications, which can be harmful to your child’s health. You will need to keep each other informed about doctor appointments. For serious issues, both parents should try to be there for the appointments. If that’s not possible, the parent who meets with the doctor should relate all pertinent information to the other parent as soon as possible. For emergencies, the parent with the child at that time needs to communicate as soon as it is safe to do so with the other parent. If the child needs special medical equipment, whether it is an inhaler, oxygen, or more complicated equipment, you will have to coordinate the transfer of such equipment when the child visits or stays with the other parent. When the equipment is complicated, both parents need to be trained in how to use it. If your child is on medication, you both need to make sure that the medication travels with the child between your homes. And both of you need to know any special handling required, such as refrigeration. To make it easier to coordinate the movement between homes, you both should have a medical sheet for your child. It should list the doctors, including specialists, with phone numbers and addresses. It should also include a checklist of all medications complete with dosage instructions. And it should list any equipment that needs to go with the child. Using this checklist will make it easier to move your child from one home to the other without leaving critical items behind. If you both keep your child’s special care uppermost in your mind, you can make the best arrangements for your child and help promote a safe and healthy environment.